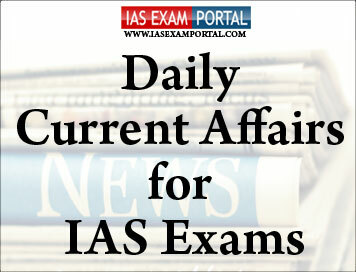 Current Affairs for IAS Exams - 2 September 2018 | IAS EXAM PORTAL - India's Largest Community for UPSC Exam Aspirants. The Vice President of India and Chairman of RajyaSabha, Shri M. Venkaiah Naidu today urged all the political parties to evolve a code of conduct for MPs and MLAs both within and outside the Houses for effective functioning of legislatures to restore the confidence of the people in parliamentary institutions. He also urged the parties to come together, transcending political considerations, on issues of national importance. Shri Naidu said “While there is cause for a great deal of celebration in the way Indian economy is shaping up and how India’s standing in the comity of nations has been steadily going up, I am a little unhappy that our Parliament Is not functioning as it should”. He suggested five reforms to improve the functioning of Parliament and State legislatures. These include; Code of conduct for legislators both within and outside the Houses, Legislators to resign before changing party and Anti-defection cases to be decided in three months time, Election petitions and criminal cases against political leaders to be decided quickly by special benches of higher courts, A national policy to ensure consistency in having upper houses in States and Cleansing of polity. Shri Naidu also urged political parties to consider issues concerning women dispassionately to ensure their safety and dignity and by ending discrimination against women on the basis of religion and other factors. He called for reservation for women in all spheres including in legislatures. Stressing that agriculture is the basic culture of the country, the Vice President called for a clear bias towards farmers in resource allocation to ensure remunerative farming and a robust food security. M. VeerappaMoily, Chairperson of the Parliamentary Committee on Finance, has said that he had not yet given up on the report on demonetisation, and he would work to build a consensus to table it by the winter session. Mr.Moily has headed the committee for the past four years. “The committee has an exemplary record. Since it was constituted, we have delivered 69 reports, all by consensus, even when the BJP is in a majority with 12 members,” he said. The members have not submitted any dissent note. The draft was circulated last year; since then, no meeting has been held to finalise it. The Chairman, according to sources, did not call a meeting on the subject, sensing the mood of the BJP members. The RBI said on Wednesday that 99.3% of the demonetised currency notes, or Rs. 15.31 lakh crore of the Rs. 15.41 lakh crore withdrawn, had been returned. According to sources, Mr.Trivedi further argued that democracy was not always about consensus, and a difference of opinion was healthy. If some members did not agree with the report, the Chairman should include their dissent note in the report and finalise it.It was the Chairman’s duty to table all the evidence the committee has collected, including from the RBI Governor and senior officials of the Finance Ministry. In an unprecedented move, the Unique Identification Authority of India (UIDAI), slapped monetary penalty on 13 banks for violating norms pertaining to authentication of Aadhaar. According to UIDAI sources, the measures taken include disincentives against a few authentication user agencies and banks that did not comply with the directions of UIDAI issued under Aadhaar Act/Regulations from time to time. UIDAI, in its show-cause notice to the banks, asked them to cite reasons as to why criminal proceedings should not be initiated against them. For some banks, the penalties are as high as Rs. 1 crore. Banks from both public and private sectors were penalised.The banks penalised include ICICI Bank, IndusInd Bank, IDBI Bank, Ratnakar Bank, Karnataka Bank and Lakshmi Vilas Bank. UIDAI said that a few banks were causing inconvenience to the people by not making the minimum stipulated enrolment and updates. Sources said these 13 entities were much short of the enrolment update targets. Meanwhile, UIDAI on Friday relaxed norms for banks on the minimum number of Aadhaar enrolments and updations, till November 1. Hon’bleMoSKirenRijiju& Amitabh Kant, CEO NITI Aayog today flagged off MOVE Cyclathon, a cycle rally to promote cleaner, accessible modes of transport. The cyclathon was held in the run up to the MOVE: Global Mobility Summit on September 7, 8 in New Delhi, and saw a participation of over 500 enthusiastic cyclists. Mobility Week’ will see 17 events in 7 days—from 31 August to 6 September 2018. These events will facilitate interactions with various stakeholders across the mobility domain. Participants include global and Indian leaders from across the mobility sector such as OEMs, battery manufacturers, charging infrastructure providers, technology solution providers, representatives from the Indian government as well as foreign governments, various inter-governmental organizations, academia, and policy think tanks. The Summit, which is the first of its kind, with over 1,200 participants expected from across the world including leaders from the government, industry, research organizations, academia, think tanks and civil society. They will come together and engage with key stakeholders within the rapidly transforming global mobility landscape and to evolve a public interest framework. The issues will be discussed based on 5 thematic papers during the parallel sessions. State specific will also be discussed, to evolve a shared, connected, zero emission and inclusive mobility agenda for the future. Air Chief Marshal Birender Singh Dhanoa, Chief of the Air Staff is on an official visit to Myanmar and Malaysia from 03-08 Sep 2018. The visit will be beneficial for enhancing the strong camaraderie and partnership that the nations and their Air Forces share. Presently, the areas of cooperation include exchanges in military training course, mutual visits by subject matter experts and joint air exercises. As foreign guests begin their visit to Beijing for an Africa-China mega conference on Monday, Chinese officials and state-media have gone into overdrive to showcase that ties between Africa and Beijing have benefited both. At the heart of the Chinese counteroffensive against allegations of “predatory” behaviour in Africa, is a myth-breaking report of the American consulting firm McKinsey. Titled, “Dance of the lions and dragons: How are Africa and China engaging, and how will the partnership evolve?”— it demolishes the fable about China’s resource driven “neocolonial” practices. Chinese officials cited McKinsey’s findings ahead of the Forum on China-Africa Cooperation (FOCAC), during which 54 leaders and high-level representatives from Africa will conduct a three-day dialogue with their Chinese counterparts from September 3. Nearly two-thirds of Chinese companies have provided skills training, while half offered apprenticeships, and a third had introduced a new technology for the local community,” the report observed. The study that covered eight African countries says that Chinese firms created nearly 3,00,000 African jobs, suggesting that “Chinese owned business employ several million Africans”. Officials also rejected the perception that Chinese banks are pushing their African recipients into a “debt trap”. Many pointed to an April report in The Washington Post that says that Chinese loans were providing a useful service in Africa. Bhubaneswar-based researchers have discovered that activation of a particular protein (TRIM16) can turn out to be a potential therapeutic intervention strategy for neurodegenerative diseases such as Alzheimer’s, Parkinson’s and amyotrophic lateral sclerosis (ALS). At the same time, inhibiting this protein in cancer cells can bring about a reduction in tumour proliferation. Studies carried out in test tubes and in mice models have shown that the protein has the ability to protect cancer cells from oxidative stress, and inhibiting this protein can therefore lead to reduced tumour growth. Normally, about 30% of newly synthesised proteins in a cell can end up being misfolded, which are then degraded and removed from the cell. Genetic mutations and stress (both cellular and environmental) can increase the rate of misfolding. When the amount of misfolded proteins far exceeds the capacity of cells to degrade and clear them, the cells tend to aggregate the misfolded proteins to reduce toxicity. When the TRIM16 activity was reduced in cancer cells in vitro, the capacity to proliferate was reduced. “The cancer cells were able to grow normally when the researchers added (complemented) TRIM16 protein, thus validating the crucial role of TRIM16 in cancer cell growth. In the case of animal studies, the researchers first removed (knockout) the TRIM16 protein from cancer cells and then introduced the cancer cells into mice models. Two Indians, Bharat Vatwani and SonamWangchuk, on Friday received the Ramon Magsaysay award, popularly known as Asia’s Nobel Prize. Mr.Vatwani has dedicated his life to rescuing mentally ill people from the streets and providing them with shelter and treatment through his ShraddhaRehabilitaion Foundation. Since 1988, Mr.Vatwani has helped around 7,000 mental patients, reuniting many of them with their families. Mr.Wangchuk has been recognised for “his uniquely systematic, collaborative and community-driven reform of learning systems in remote northern India, thus improving the life opportunities of Ladakhi youth, and his constructive engagement of all sectors in local society to harness science and culture creatively for economic progress,” his citation said. Cambodian activist YoukChhang, Filipino Howard Dee, Vietnam’s Vo Thi Hoang Yen and East Timor’s Maria de Lourdes Martins Cruz were also honoured for their work at a ceremony in Manila. All of them have worked for the poor or those who have suffered violence. India and Pakistan faced-off here on Saturday for a consolation third place, India winning 2-1 to finish third. For the houseful crowd, though, it didn’t matter and the teams, true to their reputation, played out perhaps the best match of the competition. On Saturday, Pakistan brought all its intensity to the field, as did India, both out to prove a point after semifinal upsets to less-fancied Malaysia and Japan. This was India’s third bronze medal in Asiad. Pakistan finished out of the medal bracket for only the second time, after 2002.